"Apple, Google, Amazon and IBM are the new 'four horsemen of tech,' 'high-profile public technology companies that are sure to return strong growth to investors year after year,' according to 'CNN Money.'" 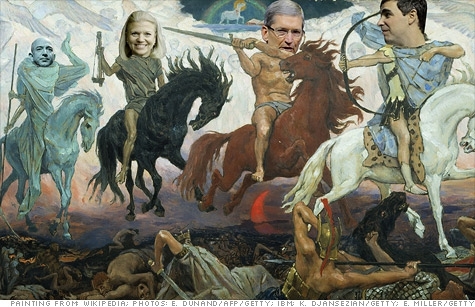 Besides Apple, Amazon.com, IBM and Google made the merry band of tech giants called the Four Horsemen of Tech by CNNMoney in their article listed here. Apple had 84% of the votes though, making it the clear winner when readers were asked to name four tech giants. Seems obvious when you look at all Apple has done over the last few years yes? What are your thoughts?